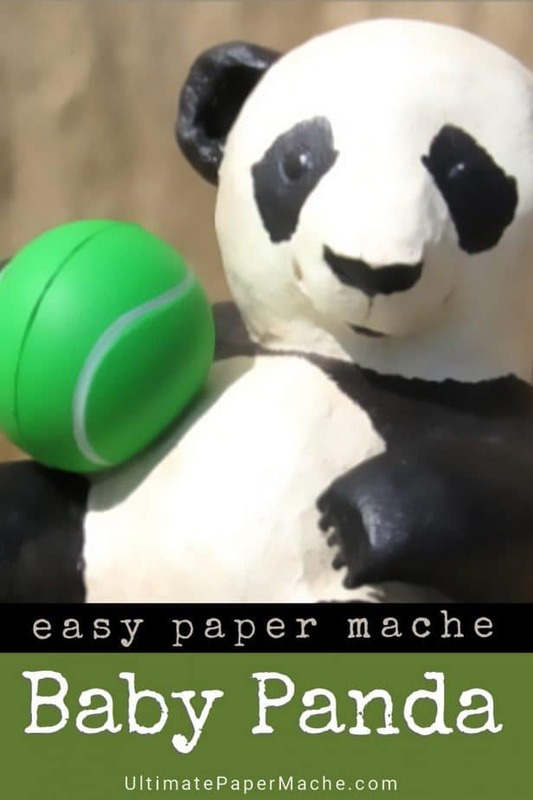 This easy pattern for a paper mache panda has been used by hundreds of people of all ages. 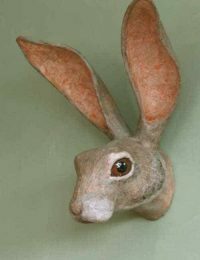 If you’ve never used a pattern to create a sculpture before, this is a good one to start with. After you cut out your pattern on cardboard, you fill out the rounded shapes with crumpled paper and masking tape. Then add a few layers of paper strips and paste, and paint. The 10-page PDF has the printable pattern and complete instructions for putting your baby panda together. 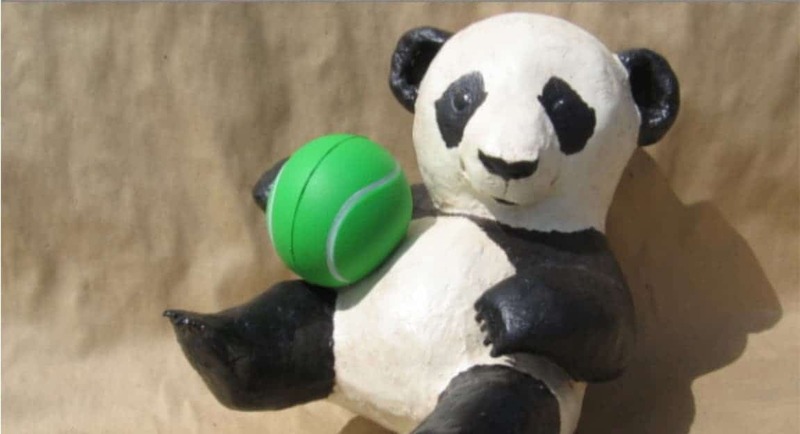 Note: Although this panda would be cute in a baby’s room, the acrylic paint and the joint compound on his fur are not edible. 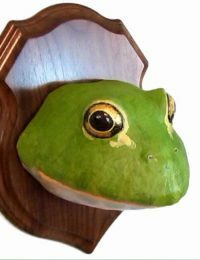 Use child-safe art supplies if you want to put the sculpture in a baby’s room. 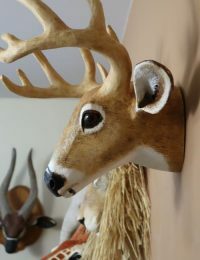 I made the following video a long time ago, before I started charging for patterns to support the costs of this website. I mention the word ‘free’ a couple of times. Just ignore those parts, and watch the video. 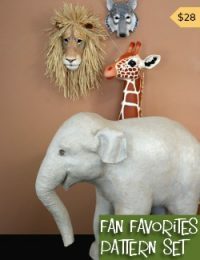 You’ll see all the steps needed to put your baby panda together and cover him with paper mache. 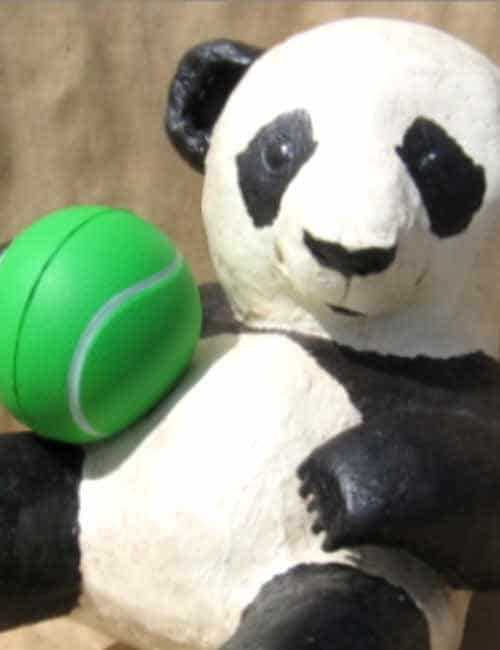 A small rubber ball or stuffed animal, for the baby panda to hold. Hi Vladimir. Did you try to upload a photo with your comment? If you did, it didn’t work. Images need to be edited to make the file size smaller than 250 kb. I do hope you’ll edit the photo and try again. We’d love to see your mask. Finished my panda! This was a fun project. You should be able to finish it in three days or less. 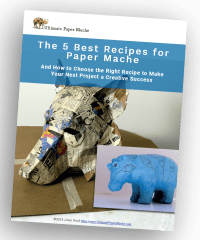 It depends on how long the paper mache takes to dry. How do I get the pattern? I have paid thinking I was going to get an email with the pattern! Hi Terry. The system is supposed to send an email right away with the download link. I’ll send a private message to the email address you used for this comment, so we can make sure you get your pattern. Your art is really cool and i like the creativity. Its not everyday you see a paper mache sculpture of some sort. I’m doing this for a project and I’m a beginner at all types of art. I find that building the body is extremely hard! This post has been so useful. I work in a nursery and we have an international day coming up. This panda is very good for display. Thank u so much for this guide. You’re welcome. I hope you’ll come back and show your panda to us. We’d love to see it.